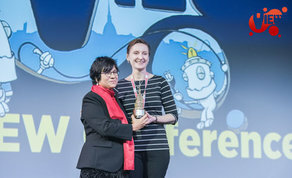 The Irish director has been honoured at Italy’s View Conference 2018 for her contribution as an artist, animator and visual storyteller. Co-founder of the Irish cartoon studio Cartoon Saloon alongside Tomm Moore and Paul Young in 1999, Twomey co-directed ‘The Secret of Kells’, which received an Academy Award nomination in 2010 and was the Head of Story on ‘Song of the Sea’, which was Oscar nominated in 2015, winning Best Film at the 2015 IFTA Film and Drama Awards. More recently, Twomey directed ‘The Breadwinner’, which was backed by executive producer Angelina Jolie through her production company Jolie Pas Productions. The animated feature follows a young girl growing up in Afghanistan in 2001 who dresses as a boy in order to work and provide for her family following her father’s arrest. Nominated for both an Oscar & Golden Globe, only to miss out to Disney Pixars’ ‘Coco’, ‘The Breadwinner’ has won a number of coveted awards across the globe including one for ‘Best Animated Feature - Independent’ at the 2018 Annie Awards. Twomey was also honoured at the first ‘Women In Animation Diversity Awards’ in Vancouver for her efforts in tackling cultural differences and the gender pay gap. Based in Torino, Italy, the VIEW Conference is Italy’s premier event for computer graphics, interactive and immersive storytelling, animation, visual effects, games, and VR, AR, and Mixed Reality. Top professionals from the industry attend for a week of talks, presentations, and workshops. This year’s conference ran October 22-26 at the Officine Grandi Riparazioni in Torino.